•Please call or email the shop to pay by VISA, MASTERCARD, MAESTRO, PAYPAL, Bank transfer. The FOCUS™ LT bass cabinets represent an evolution in cabinet design blending progressive, lightweight cabinet construction with ceramic drivers optimised for today's player. 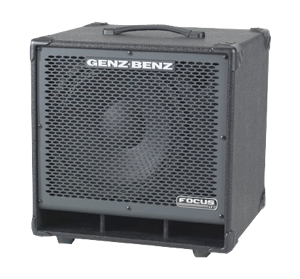 These compact, classic configurations are available in 4 models, each developed to deliver demanding performance, tight focused bass response along with design features you would only expect from GENZ BENZ. The FOCUS LT cabinets are also great choices for matching with any of our SHUTTLE or STREAMLINER bass heads. All models offer compression tweeters, ¼" and Speakon® connections, 3 way tweeter level control and are as compact and lightweight as possible, yet built for the rugged demands of night-after-night touring. The most popular configuration in the line, this 4x10" and tweeter model is an exceptional single cabinet choice. With its abundant output, thick low end and mid clarity this cabinet is ideal for a variety of music styles and delivers the warmth and muscle of the ceramic drivers with room-filling authority. 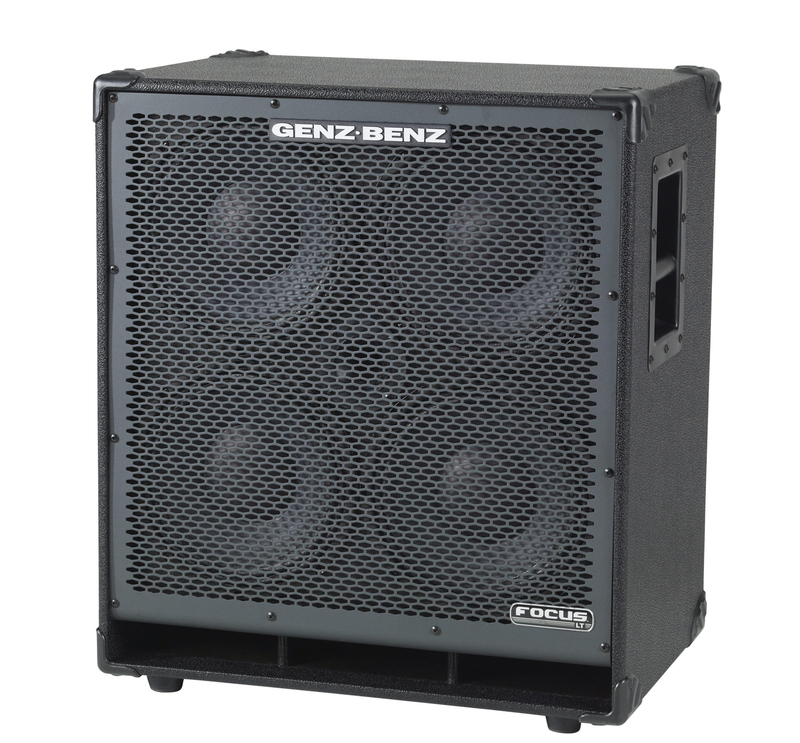 Extremely compact, powerful and lightweight for its class of bass cabinet. 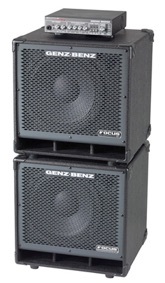 Size - 26" x 23 3/4" x 16 1/4"
A great sounding extremely portable 1x15" with compression tweeter which is an ideal choice for use as a stand-alone cabinet or mated with either our FCS-210T or FCS-410T. Although small in stature this cabinet can deliver pounding "old school" tone or with the tweeter turned up, articulate, crisp, full bodied, powerful output. Size - 22" x 23 1/4" x 16 1/4"
We’d been asking for less expensive cabinets and combos for the European market for some time, and Genz Benz dutifully obliged at this years NAMM. Such was the success of the new ‘FOCUS’ cabinets, Bass Gear Magazine awarded them a ‘Best in Show’ award, one of only 6 awards that they give out at the show. I finally made it past the GB booth and I must say the new Shuttle stuff is far and away the best I've heard in the line yet. Enough so that I'm probably gonna' get a rig and run it through some paces. Just have to decide which pieces. I'm mostly thinking about the 9.2 (or Max 9.2) and a pair of the 210 cabs. While I was there, however, I did hear both of the 112's together as well as the new Focus cab line. Very impressive. I predict the Focus cab line will be a huge seller. Even though they're not NEO, they're still very light and can really take the juice and pump out the sound. One of the things I really liked about the new Shuttle line is how they mellowed out the profile buttons. Previously, I pretty much needed to re-EQ with each one, which is not the way I like to use a contouring control like that. The added level control on the Max's solved the problem on those, but the new 6.2 and 9.2 are pretty much where I'd want them without it, so the simpler amp design is now a more viable option. Another thing I really liked is how they added gain and made the distortion a bit creamier. Just seems to generally sound better to me. And while I didn't really get a chance to push it into 3DPM, I heard it on Ed's vid, and I like that a lot, too. Bottom line, it's a great rev to the product line. +1 They made nice changes across the board. You can now push the tube harder in the 6.2 and 9.2, very similar to the tube channel on the MAX heads. The changes to the global tone controls is nice, too, and it did seem like the low mids were thickened up a bit, though some of that could have been the cabs, too. The ShuttleMAX 9.2 is still my favourite of the line up. I don't need the smaller form factor, and it's light as all get out. The features are great, too. I still dig my ShuttleMAX 12.0, but I would have picked the 9.2 over the 12.0 if it had been available at the time. What really blew me away were the Focus cabs. They sounded like they belonged in a much higher price range, and the light weight and form factor was very nice. We ended up giving Genz-Benz one of our six Best of Show Awards for the Focus line of cabs, and I think they totally deserved it. It was great to finally make it to Warwick. What an amazing place you've made, entirely different from any music shop I've bought from before, great knowledge base, understanding of what would work well for a client and amazing gear. My Genz Benz shuttle 600 and 2 Focus 112 cabs had their first gig last night in a big room full of people as part of a loud rock band. They were fantastic! They cut through the mix in a way I'd never managed with my 4x10, 1x15 rig, and just sounded great. Loads of bottom end for my low B, flexible middle and really sharp tops. Punchy, clear and complete. At half time there was a cluster of bassists and guitarists from the crowd around my rig! Several assumed i was also going through the PA, which I wasn't. The blokes in the band were also very impressed. Thanks to you both for your advice, I'm watching out now for that tobacco burst rosewood MTD so hope to be back in March. Streamliner 600 and Focus 112T cab. Hi Mark, I just wanted to say how pleased I am with the Genz Benz amp and cab. Plugged in yesterday and totally knocked out by the warmth and character of the Streamliner 600 its a real gem I've never had such a good sound in well over 25 years of playing. I expected the amp to be good but the real surprise to me was just how good the cab is, its incredible. The single 112 is probably going to be enough for most gigs I am likely to do but I just might get a second cab at some point for the hell of it as I imagine that would cover just about everything. 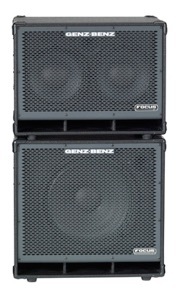 Hi bass direct i just wanted to say i am absolutley loving my new genz benz head and cabs it sounds amazing for slap or fingerstyle. It brings out the true tone of any bass and it has plenty of power for such a small light weight rig. The presets are great too. The cab arrived safely on Friday, thanks for leaving the voicemail regarding the delivery. I used the cab for a rehearsal on Friday evening and it sounded great with my Little Mark Tube 800, plenty of depth and definition, lovely and light and easy to transport. I had seen Larry Carlton’s band in Cardiff earlier this year and Claus Fisher was using a pair of them so I had a good idea of what to expect. Just to let you know the focus cabs arrived on Friday. I've gigged them three times since then and I am delighted. I shall certainly contact you again for my future bass needs. The cabs were everything i expected and more. Just want to say a thank you for your time and advice re amplification and bass. My Clover Avenger 5 sounds great through the Genz shuttle and focus 410. Amazing clarity and definition no matter what you throw at it. Thanks again Mark...after purchasing 2 Genz heads in the past couple of years this time round I purchased 2 focus cabs, the 15" version. You are my go to shop now and as always the service is spot on, the knowledge is spot on and the speed of delivery is spot on. One of the cabs was a '2nd' a demo from the shop....it was brand new in my eyes and £80 cheaper....bargain. Both of these cabs together took my face off, one of em was ridiculously loud matched with my Genz shuttle 6, 2 of em.....dangerous. Cheers Mark, I think other shops could do with learning a thing or 2 from you. Finally got to try out the Streamliner 600 with the 2 Focus 1x12s. Absolutely brilliant. This amp, is one of the best I've ever used! Can dial up any tone you want, the mid scoop filter in conjunction with the parametric mids really do shape your tone, boosting it at 2khz with scoop in really gives you a nice slap tone, and boosting it set all the way down to 150hz gives a nice warm tube tone. The cab with this amp is amazing too, it does sound like one mushy mess, the low frequencies are really tight and doesn't sound muddy at all, and the clarity is just beautiful! The tweeter control can change your amp from vintage to modern just with a flick of a switch! If you are looking for a very versatile amp with great sound, get Genz Benz! I'm glad I did! Just a quick note to say thanks for the help and advice you gave me regarding cabs. They arrived on Monday and like you said they sound fantastic! The 115 & 210 really do compliment each other, a real nice warm, punchy sound. The build quality looks to be great and they are a whole lot lighter than what I've been using! Fantastic product, first class service and VERY reasonable postage costs (important to me living on an island way up in Scotland). Sometime in the future I want to upgrade my bass, I will definitely be giving you a call! 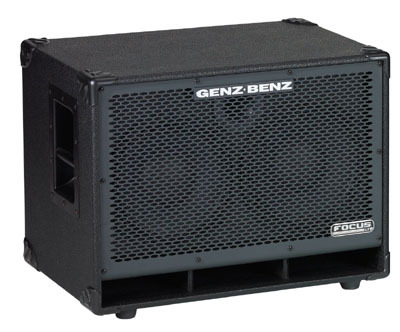 I parted company with my 500 watt Ampeg setup and went with the 600 Genz Benz Streamliner and one 210 Focus cab to start with. Another Genz cab will follow shortly to max the full 600 watts. I added a spare 15 inch cab I already had because I knew I needed volume to spare and played it last night at a gig with a drummer who was partially deaf and didn't hold back at all with power. I was able to hear every note, crisp and clear above the drummer and a loud guitarist without pushing it too hard. The 10 inch speakers are so much better than the 15s I have been playing previously, the clarity and snap to each note is so reassuring. I had read all about this gear and it is all true. If I had known it was so much fun I would have done it much sooner. Thanks to Mark at Bass Direct for sound advice and patience. As always, very helpful. I just want to thank you for getting the Genz Benz Focus 112T cabinet to me so quickly. It arrived this morning. I am very pleased with it. This cabinet has excellent tone and volume, and is a quality product at a bargain price. Once again exactly what I wanted. Practice last night was a gem. 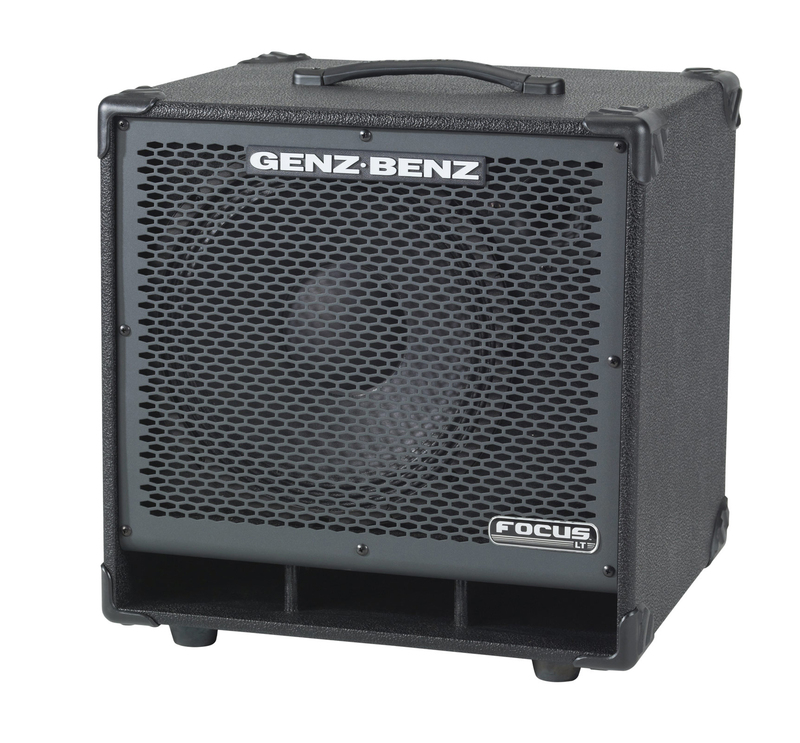 The Focus 4x10 had a strong, solid and amazingly deep sound for such a small cab. It does work remarkably well with my streamliner. This compact 1x12" cabinet delivers big tone on tight stages. 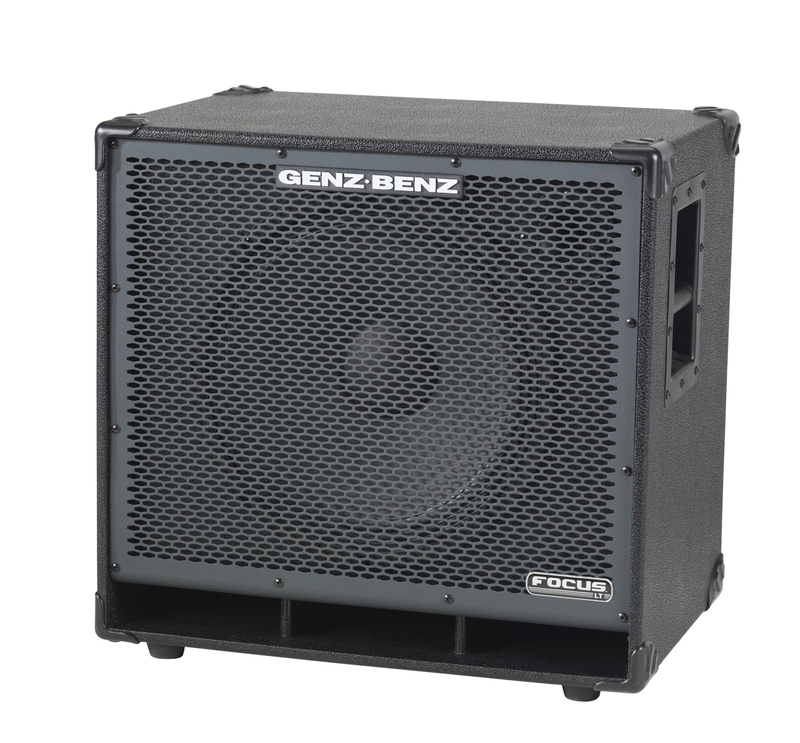 This is an excellent cabinet solution for players requiring full-bodied, dynamic reproduction in an extremely compact bass enclosure. 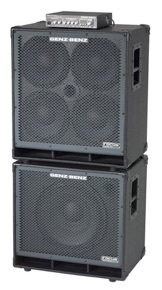 Ideal as a single cabinet or 2 stacked together for higher output on larger stages. Size - 17 3/4" x 17 3/4" x 16 1/4"
Our 2x10" and tweeter design offers excellent focus and definition designed for use as a single cabinet or as part of a powerhouse stack with our FCS-115T. The 10" drivers deliver thick mid response and tight low end support with the warmth and muscle players appreciate from ceramic drivers. Size - 18" x 23 3/4" x 16 1/4"
All prices are current and are subject to change and include UK VAT . If you are purchasing from outside the EC (European Community) we can deduct the VAT from your items. GENZ BENZ warrants all products to be free from defects in materials and workmanship, for a period of 2 years from the date of purchase, when purchased from an authorised GENZ BENZ dealer. This warranty does not cover normal wear and tear incurred from the normal designed use of the product and specifically limits the warranty for tubes to 6 months. This warranty is only effective if a copy of the original sales receipt is presented at the time of warranty service. •Has not been misused, abused, tampered, altered or damaged either by accident or during shipment. •Has not been subjected to excessive or insufficient power, i.e. burned or discoloured voice coils. •Has been returned to GENZ BENZ or its authorised service centre, freight pre-paid, together with a copy of the original sales receipt, from an authorised GENZ BENZ dealer. •Has been registered with GENZ BENZ within 10 days of the purchase date. •Has its original serial number intact and it has not been defaced, changed or removed. Any products which may be used for rentals, while in the dealer’s inventory, shall be covered from the date of the original invoice to the dealer. If rented products are subsequently sold from dealers stock, this warranty shall be in effect only for the remainder of the warranty period not yet used. GENZ BENZ makes no other warranties, written or implied, with respect to its products merchantability or fitness for any specific purpose, other than covered in the duration of the length of this warranty. This warranty gives you specific legal rights, which may vary from state-to-state.